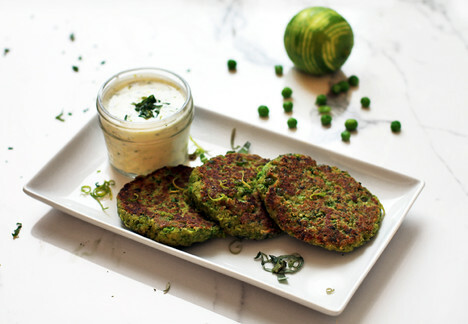 This protein and fiber packed fritter is delicious for adults and their littles! 1. In a food processor, add almond flour, 1 cup peas, egg, 1/2 cup basil, mozzarella and lime zest. Process until almost smooth. Transfer mixture to a medium bowl and add remaining 1/2 cup peas. Season to taste with salt and pepper. 2. In a non stick skillet, melt butter over medium-low heat. Divide the mixture into 6 patties. Place patties into skillet and cook for 5 minutes, flip and cook the other side for 5 minutes. Patties should be golden brown on each side. 3. While patties are cooking, in the same food processor, add remaining 1/4 cup basil, juice of 1 of the zested limes and yogurt and process until smooth. Transfer to serving bowl and serve with fritters.